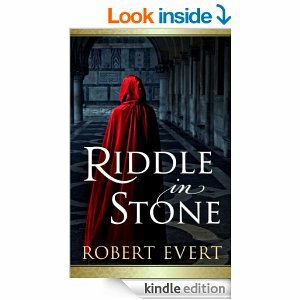 The first book of Robert Evert’s ‘Riddle in Stone’ series is one of the best books in the fantasy genre that I have ever read. The plot of the story is fantastic & one cannot find one dull moment in the whole book, it is quite a page turner (scroller). Once you start reading the book you tend to get caught up in the life of Edmund the protagonist of the story seeing through his eyes a continent which is similar to the Middle Ages of our fables. The characters are lively & full of zest, always ready to face danger for the sake of what is right. The story of Edmund a middle-aged man who has spent his whole youth memorizing the books that is contained in his library in his little village called Rood is captivating. Edmund’s leaving his little village to seek out an adventure for himself speaks to the soul of a reader who also longs to do something spectacular for the world to remember. The story is about Edmund’s ‘never give up’ spirit as well as the fact that when one loves someone to excess…one can do anything for that certain someone, just the way Edmund risked his life for his love Molly. As stated earlier, the characters are full of life & adapt to their situations & their roles perfectly. Whether it is the optimistic Pond or the vile Undead King (Kar Nazar), the mysterious Edith or the ever faithful dog Thorax, the sage Thorn the Elf or the gruff Turd…everyone has a beautiful role to play to make the story ‘Riddle in Stone’ reach to the heights of excellence in fantasy literature. This book also is a complete treat for book lovers as it is based on ancient fables made up by the author which is scattered through many different books, scrolls, journals etc., mentioned in the main story in a ‘matter of fact’ way, that it seems that we have known these fables from time immemorial. The reader of this book will also take to the protagonist of this book easily as he seems a sort of person we all really are when it comes to making difficult choices & about walking in the danger zone for the right cause. The chapters move on smoothly throughout the book each one more interesting than the previous one. The author, Robert Evert, has shown remarkable talent where it comes to leaving a spell of suspense in his chapters especially at the end of each chapter so much so that the reader cannot help but want to continue to read the book. I also must commend the author of using a unique style of writing where he pens down the conflicting thoughts in Edmund, the protagonist’s mind which is at times hilarious & at other times deadly serious. Robert Evert has brought out many morals & a sense of survival ethics via this book. This is seen especially when Edmund is trapped in the mines of the Hiisi (goblins). The author has also brought out the evil side of human nature in the form of the Hiisi which at times shocks us yet which still makes us want to read more as we sympathize with the virtuous characters in the story. We especially feel pity for the protagonist when he loses his left eye & we tend to catch the sob in our throat when we read about of the faithful dog Thorax…these emotions are stirred within us very effectively by the author with his excellent narration skill & his dramatic story line. The title of the story is apt to the main theme of the story which centres on a code carved on a stone in the tower of the Undead King Kar Nazar. Through the author’s perfect descriptive skills, the reader is transported to the depths of despair as well as to the joy of freedom with the main characters in the story. The 3D image of our imagination is fuelled by the author to such an extent that we are whisked off our feet into the land of the author’s imagination. Lastly, I would like to state that this book was a great read for me & can be read by not only adults but also young adults. I can’t wait to read the rest of the author’s series.